When I first got a garden which really belonged to me, in Bognor Regis my home town, I was quite clear what I wanted to do with some of it. I had sea defence timbers, real beautifully warn breakwaters from a couple of different locations and some cedar decking. The decking sections became a jetty, the sculptural sea timber was placed to create depth and then the planting was the sea. A rough sea with spume from Stipa gigantea or Giant Oat Grass flowers, huge but delicate Crambe cordfolia flower spikes and white flowering annuals which I change from year to year. Having done one show garden which had to be to a set theme I now knew what I really wanted to present for my next display. 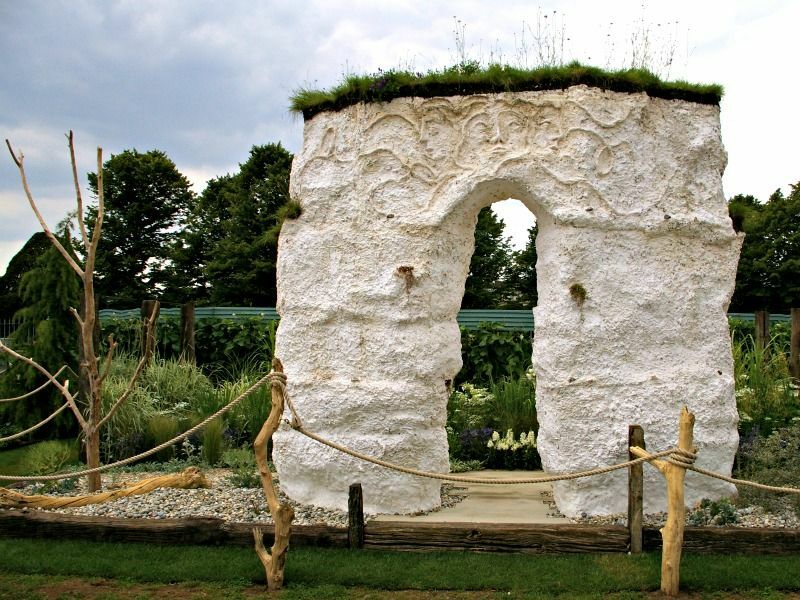 The RHS put forward a theme of English Poets’ for Hampton Court 2011, 6 different Poets’ each of which would have one garden based on one of their works. As this had a bursary it was an attractive proposition and when I started reading I soon found a sonnet by John Keats called ‘On the Sea’ which fortunately spoke of the calming and cleansing effect of the being by the sea which I know so well. When last the winds of Heaven where unbound. Until Ye start! As if the sea nymphs quired! The main body of the garden I already knew, basically very similar to my own garden space but some different plants timed for the July show. The Sonnet ends with reference to ’some old cavern’ and although I could tie in the rough sea, the odd shell and maybe even the horizon I knew the ultimate prize depended on presenting a garden which fully represented the Sonnet. So I casually added a large chalk archway to the front of my design as the mouth of the cavern (not enough room or materials for a whole cavern). The wideness of the sea was to be made by having acrylic mirrors on each side of the 8 by 6-meter garden and I had long since wanted to make a path to look like sandbars which we did with an old favourite material, roof battens. It wasn’t until I looked up Hecate in a very old book, in a bookshop in Arundel, that I realised I needed a sculptor. In the same bookshop, a Herculean figure was photographed rising from a cliff face, some of the natural features making up his hair. I wanted to recreate this semi-camouflaged look for the three faces of Hecate, apparently the most powerful of the Titan Gods. I was very fortunate that a local sculptor, Lou Johns, was keen to get involved as building a cliff, even a small one, is no small undertaking! Especially when it has to go on the back of a lorry in pieces and then go back together again. It was a triumph though and I knew as soon as I had had the idea that this would seal all the references to the Sonnet and put in the running for the ultimate prize, the Best in Category prize. ‘On the Sea’, the garden was awarded a Gold Medal and ‘Best English Poets’ Garden but it means even more than that because it was personal to me in its theme. My ‘On the Sea’ show garden was selected to be the English Poets’ Garden featured on BBC2 in their coverage, which you can see below and follow up on the BBC Website I must thank in particular Lou Johns for her hard work and also Dave of Meadowgate Nursery in Sidlesham, for bringing a white cliff to Hampton Court.